Q&A Tuesday: What types of bulk caramel do you sell? Currently, we sell three different types of bulk caramel: Traditional Caramel, Red Candy Caramel, and All Natural Baker’s Caramel. Traditional Caramel and Red Candy Caramel are dipping caramels, perfect for use in dipping caramel apples due to the way they coat apples in an even, beautiful, shiny layer and are sticky enough to hold onto a variety of toppings. They are great for other applications, too, like drizzling on desserts, using as an ingredient in recipes and sauces, and, of course, dipping things other than apples (bananas, pears, grapes, cookies, marshmallows, pretzels?!) 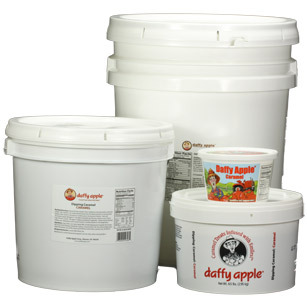 Both are packaged in a variety of sizes ranging from a 20 ounce tub to a 5 gallon bucket. All Natural Baker’s Caramel was developed for, and is currently used by, grocery store bakeries for baked goods like cakes and brownies and cookies and tarts. It has a creamier texture and does not contain the sticking power of our other two bulk dipping caramels, so it is not recommended for caramel apple dipping. We are, however, currently working on an All Natural Dipping Caramel we hope to have available for retail sale by this fall. 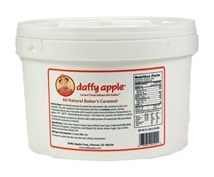 Our All Natural Baker’s Caramel is currently packaged in super easy to use 6.5lb microwavable tubs. Posted in Bulk Caramel, Daffy Farms, Q&A Tuesday, The Daffy Apple and tagged all natural, baker's caramel, baking, brownies, bulk caramel, cakes, caramel, caramel apple, caramel apples, cookies, culinary, daffy apple, daffy farms, desserts, dipping caramel, gluten free, Q&A Tuesday, red candy caramel, size, traditional on March 25, 2014 by daffyfarmsblog.